I am speechless. I am not even sure where to begin addressing this. 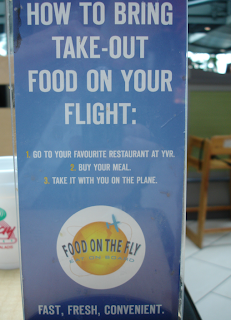 Someone at Vancouver International Airport actually convinced others to get a budget for a project to tell people how to bring food on an airplane. They developed a small logo for their project. Do they really think we need signs to help us? Did they envision that people are too clueless to figure the three steps out for themselves (1. buy food; 2. ask for it "to go", 3. bring it on plane)??? WTF??? These signs are everywhere. This is one project I am glad I was not in any meetings for. I would have strangled someone. Every year I blog after Java One and recognize one company, demo, entry, exhibit that is better than all others. In 2006, this award went to a robotic Lego and Java demonstration. This is never an easy task since there are so many cool things at Java One. This year is no easier. 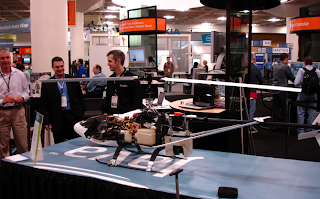 After much internal debate and watching the "wow" factor from peopel seeing things for the first time, I bestow the 2007 Duane's World "Best in Show" award to the Java powered helicopter. Das ist ein sehr gute Hubschrauber! Runners up were the Sun SPOT (Small Programmable Object Technology) and the Quebec University students Java submarine. the latter failed to make tops given they have not yet included an adaptive algorithm to learn and re-program thrust bursts based on Causality Event Programming models (The thrusters usually over-compensated in attempts to level the device). While it is not "kinderspiele" (Child's play), it could be done with minimal effort. Quebec has a long history of great technology and good hockey goalies so I look forward to seeing what they bring next year. Disclaimer: I excluded the Flex, Apollo and Java PDF code from Adobe. Java One 2007 is full on! My favorite was the helicopter but I also can't wait to start developing with the SunSpot devices. I think I am going to build a solar tracking device. Anyways - thanks to all of you who came to my talk. I was overwhelmed with the great reception and applause and felt really humble to be appreciated by such an esteemed and knowledgable peer group. I don't use Java every day so I was happy to see all the code I wrote for you compile the first time. Felt like I dodged a bullet. Here is the first class (DuanePDFClass2.java). You will need to download the XPAAJ.jar file to make this work. The other class is directly below. You should also know that we are moving towards the XML friendly version of PDF ("Mars") which will allow any developer to work with PDF XML formats using the XML parser in their native language. For the long term, this is a much better solution than us developing libraries for each and every programming language. method to save InputStream to a file. System.out.println("Writing the array of bytes into the file "
Here is the second class which casts the input stream handed off by the Document factory class into a buffered stream reader and strips out the XMP metadata. * Use this at your own risk and don't whine/winge on to me if it doesn't work. * You will need to have XPAAJ.jar from Adobe labs. //Call the PDFDocument object's exportXMP method. //Get the byte size of the InputStream object. // Read into a Buffered Reader Stream. //Create an array of bytes. Allocate numBytes of memory. //Read the XMP metadata by calling the InputStream object’s read method.